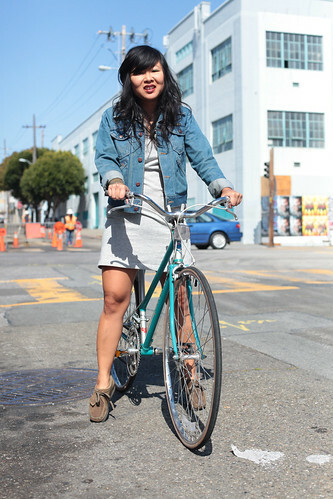 Here's what real people are wearing to get places and they're all getting places by bicycle. Submit your bike wardrobe remix to our flickr group and see yourself in Vélo Vogue. this is really rad! great work, r! Can't we vote for our faves? So far, bloomer girl gets my pick. Love the matching eyelit on her little flats..
Sure you can vote! But we'd rather have you contribute a bike to bar pic instead so we can vote for you! I always consider riding my bike to work, but I'm sort of terrified of riding without a helmet and other protective gear. I wonder how these girls have gotten past that. Maybe I'm just a little paranoid. Adiel - scroll a little further down the blog and there's links to some awesome helmet designers who make cool, fashionable helmets - Nutcase, Bern, Yakkay and Sawako Furuno. If it makes you feel safer, then wear it! When I commute to work, I always feel safer when I wear my helmet riding down busy thoroughfares. thanks, KT. and thanks remixers.